Radio psychologist Jacob Temple is found dead on the floor of his den. A gaping wound in his neck, lacerations crisscrossing his chest, a fork bored into each eye. Bouncing back and forth in time, the story of Jacob Temple's life unfolds as told by the people closest to him, particularly his ex-girlfriend Jane Light, who has been stalking Jacob for nineteen years, ever since he left her. Still reeling from her boyfriend Noah's murder, Kadee Carlisle works alongside Detectives Poole and Gibbs to unravel the facts behind Jacob Temple's life and death. As time ticks away, Kadee struggles to reconcile her conflicted feelings about her own past--and present--and their ominous parallels to the Temple case. 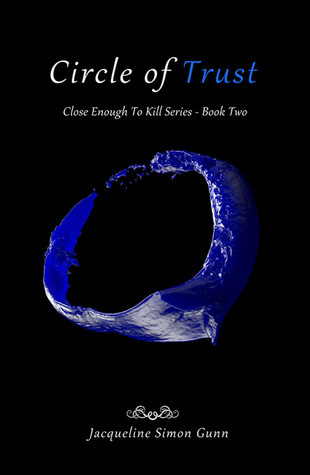 Circle of Trust is the second book in the Close Enough to Kill series. You need to read this trilogy in order to avoid confusion. There were numerous references in this book to the plot in book 1 and even though I enjoyed book 2, I think it would have been much better if I had read book 1 first. Circle of Trust is a psychological thriller of the best kind. Characters trust people that they think are their friend, while as readers, we know that they are their worst enemies. There are many twists and turns in the plot and it ends with a surprising cliffhanger. Book 3 - Circle of Truth is due out before year-end so readers don't have to wait too long. The author is a clinical psychologist and it shines through this novel as she looks into the minds and motivations of the characters. I really enjoyed this book and am looking forward to reading books 1 and 3. About the Author: Jacqueline Simon Gunn is a Manhattan-based clinical psychologist and writer. She has authored two non-fiction books, and co-authored two others. She has published many articles, both scholarly and mainstream, and currently writes for Lifetime Daily. With her academic and clinical experience in forensic psychology, Gunn is now writing fiction in the thriller/mystery genre. Circle of Trust is the second book in her Close Enough to Kill series, which explores the delicate line between passion and obsession, love and hate, and offers readers an elaborate look into the mind of a murderer. In addition to her clinical practice and writing, Gunn is an avid runner. Gunn is currently working on multiple writing projects, including the third book in her trilogy.